While several measures have been suggested to contain the rupee fall which has depreciated nearly 13% since the beginning of this year, you will be surprised to know that the Indian currency is not the only one to lose major ground due to geopolitical and fiscal factors. 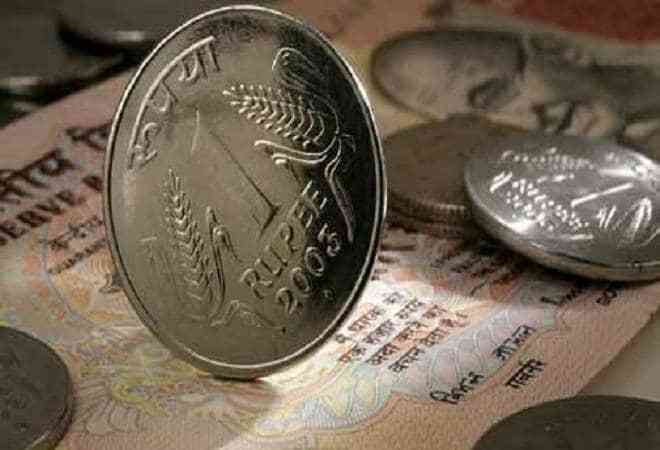 The Indian rupee breached 72.50 level against the US dollar for the first time ever on Monday and hit an all-time low of 72.67, down 94 paise from its previous close of 71.73 level to the dollar. Later, it closed at 72.45, logging a steep 72 paise fall on growing fears of contagion from an emerging-market rout and escalation of global trade war. With Rajasthan, Mizoram, Chhattisgarh and Madhya Pradesh set to face assembly elections this year and Lok Sabha elections scheduled to be held in the first half of 2019, the BJP government has come under fire from opposition parties for its inability to shield the common man from the effects of a falling rupee and high petrol, diesel prices. 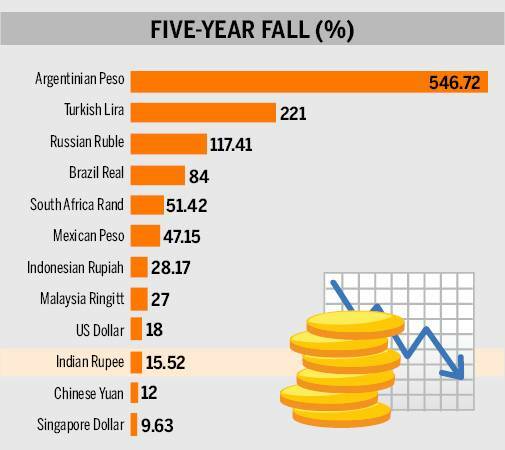 In fact, during the last five years, the rupee has lost merely 15.52%. On the other hand, key currencies around the world have lost significant portion of their value against the dollar during the same period. For instance, Argentinian Peso fell 546.72%, Turkish Lira was down 221% and Russian Ruble lost 117.41% during the last five years. Hit by high inflation at 30%, interest rates at 60%, higher taxes and a severe drought, the Argentinian economy is on the verge of a collapse. Peso lost major ground against the Dollar in April due to investor concerns about the government's ability to control inflation and interest rate hikes by the US Federal Reserve, which strengthened the dollar worldwide. The depreciation made Argentina's dollar debts more expensive for the government, prompting it to turn to the International Monetary Fund (IMF) for a $50 billion loan. South America's second-largest economy announced an economic emergency and unveiled a dramatic new set of austerity steps last week to quicken the release of previously agreed $50-bn bailout loan- the larget in IMF history. Turkey relies heavily on foreign-currency debt. Corporate, financial and other foreign currency debt, mostly dollar-denominated, constitutes about 70 percent of Turkey's economy. Of late, a rising dollar has compounded problems of loan and interest repayment in foreighn currency. In Turkey, inflation surged to 17.9 percent year-on-year in August, its highest level since late 2003, prompting the central bank to signal it would take action against "significant risks" to price stability. The Lira has lost more than 40 percent of its value this year due to concerns over President Tayyip Erdogan's grip on monetary policy and, more recently, over a diplomatic row between Ankara and Washington. Russia's Ruble has been hit by the news of fresh US sanctions over Moscow's alleged poisoning of an ex-spy in Britain. The currency has also taken cues from the Turkish Lira crisis which sent currencies across the world tumbling against the dollar. Of late, sanctions over Russia's use of a chemical agent, Novichok, to poison former Russian spy Sergei Skripal and his daughter Yulia in Salisbury, England, in March have sent the ruble lower. Analysts said high crude oil prices also led to the currency depreciation. Here's a look at worst performing currencies across the world in five years.